Our Johnson pipe organ, (originally tracker action), has three manuals and 27 ranks. It was built by William A. Johnson and his son of Westfield, MA, in 1871 in a rear balcony and later moved to a front chamber in 1885. It was rebuilt by Chester A. Raymond (Princeton, NJ) and moved from the front of the sanctuary to the rear balcony in 1959. 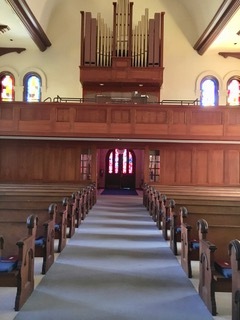 The organ console was replaced in 1989; the Great division was repositioned by Kerner and Merchant Pipe Organ Builders, Ltd., in 1994, and was renovated in 2004. This organ is mentioned in the book: “The Johnson Organs” by John Van Varick Elsworth, ed. By Donald Paterson, The Boston Organ Club Chapter of the Organ Historical Society, Harrisville, NH, c/r1984.